I was inside of death before I had been born. My mother had been dead for three minutes when I was loosed from a gash under her navel. My father preferred to not talk about my birth at all but when probed would make fantasy. He’d say I was born like Eve from Adam’s rib, like Athena from Zeus’ skull–cracked open and split. And in that way I was entirely of him and no part of death. The explanation satisfied both parties in a fuzzy and incomplete way. He accepted that he would wear the role of the mother the way children wear school uniforms–with a sense of unsure obligation. I pass my days entirely in bed. If I ever have left my bed, it was a dream, or a memory so distant I no longer feel nostalgic for it. As an infant my father was told that my muscles were spongy, porous from a violent birth. And I suppose I never tried. He never asked me to. Those were my legs, there they were. Excess body. A parade of specialists recommended rigorous exercise–a nurse pumping my legs like a bicycle mid-air. But my father said no, never wanting me to feel the strength of my legs so that I would never grow resentful for not having it. Together we watched them grow willowy, formless. My doctor came once a week to treat bedsores. He was slight, anchored by his leather medicine bag. It was the medicine bag that I first noticed about him. Pockets and spaces for things that seemed too antiquated for modern medicine–amber vials with rubber tipped droppers, magnifying glasses, cloth bandages. The bag always slightly agape but never fully opened, a sliver opening into another world. My father did all the talking and then would seat himself in the corner of the room, his body bent forward and angled towards mine. There was always coffee resting tenuously on his knee. It stayed untouched. The steam dead in the cup. I could sense when the doctor was preparing to touch me. The hands hadn’t materialized but his intention grew thick, pushed up like oil. And I’d brace myself for something cold, for medicine in the touch. But he always started at the nail, the hardness as a warning and then sliding into the balls of his fingertips–the beginning of warmth. He would roll me to my side, finger the back of my ribs and I would become aware that I had been sweating, my shirt struggling to stay close to skin. Before treating the sores, he circled them, felt their limits. I relaxed into his fingers, let them knead through me, come out the other side. I wanted to pull him, to pull him through–the needle through cloth. I had read somewhere that stuffing wounds with tobacco thickens the blood, coagulates the sore. And I thought about my body, the abscesses filled with tobacco and me as his cigarette, brought to his lips and then inhaled. When he was done, he’d pull the sheet up for me though he knew my arms could have done the same–his hand ending at my shoulder and squeezing to say goodbye. The only time we faced each other was at his arrival. Even when he left, I kept my back turned looking towards the window blinds–the silver dust, the way it floated off when vibrated, too small and left behind by gravity. 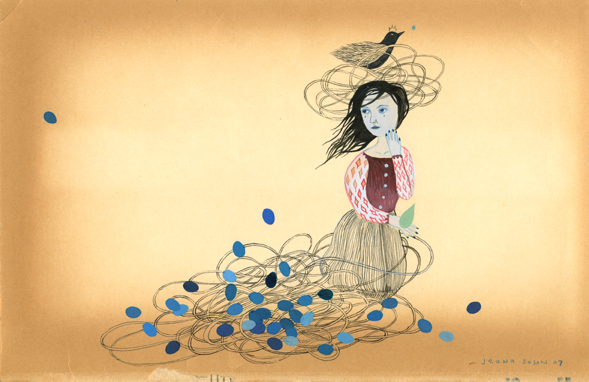 Image: “Delicate Exploration” by Jeana Sohn.